Living on the East Coast, we feel the seasons so starkly and they affect us in so many ways. There is a huge difference between our lifestyles and eating habits between the seasons. In the fall and winter, we're craving hearty soups and stews to fortify us against the cold while we huddle indoors. In the spring and winter, we throw off our coats, raise our heads and sprint to the farmer's market to feast on the inspiration from seasonal produce like fresh berries. I sometimes wonder what it would be like to live on the West Coast and enjoy more sunshine and longer days. I figure we'd have a healthier lifestyle and feel less rushed given the longer light hours to do things. At the same time, I can't help but think I'd miss the cozy feel of winter and the Christmas holidays that just seem more genuine against a cold backdrop. I guess, like anything else, it's a trade-off equation. So what we do is make the best of what we have! Enjoy the best of each and every season. And lately, I've been enjoying the vibrancy and colors of fresh local produce. There's been plenty of salads on our table but there's always room for dessert at any season. Eating fresh fruit plain and straight-up is still my first response but once in a while, it's fun to cook with it or use it for a little embellishment. I've been in "embellishment" mode lately, preferring to augment or finish my dish with some of these seasonal jewels. These individual whipped cream bundt cakes pair so nicely with the fruit because I always think of the classic dessert pairing of "strawberries and cream". These are literally whipped cream cakes, in that they're made with cold heavy cream that's whipped to stiff peaks to anchor the batter. The heavy cream in essence replaces the typical butter or oil in a cake recipe. Months ago, I watched Martha make these cakes on Martha Bakes and the recipe actually comes from Rose Levy Beranbaum. I was mesmerized by the idea of the cream-based cakes, and the presentation itself, so I planned to make them once berries were more readily available. And now here they are. I took my small bundt cake tin and baked a few of these little whipped cream cakes. I grabbed organic strawberries, raspberries, and blueberries from the market (all of which happened to be on sale - score!) and I was ready to assemble this dessert. I highly recommend whipping up some additional cream to nestle the cakes on top of. Not only does the lightly sweetened, softly whipped cream round out the dessert nicely appearance-wise, the extra creaminess just goes so well with the fresh berries. You get a bite of buttery golden cake, with the sweet-tart freshness of the berries, mingled together with the pillowy softness of sweet cream. It works and it's something to savor over at the table. Mix up the berries you serve with each cake, go heavy or easy on the whipped cream...however you spin it, I think it makes a beautiful summer dessert that's easy enough to make any time but special enough for a special occasion. We are getting ready to celebrate a very important birthday! June is always a busy and important month - it marks the end of the school year, the beginning of summer, Father's Day, and it's the month of my son's birthday. It is an especially big milestone this year because he turns 10! It's a little mind-boggling that a decade has gone by. The little infant that wouldn't sleep more than half an hour or so at a time at night has somehow grown by leaps and bounds. It's been quite a journey and to say that having a child makes time speed up even more than it already does is an understatement. We're lucky to have this little guy and I hope he will have many, many more happy birthdays for years to come. My birthday wish for him is, as always, to have a very good, happy life. Right now, let's focus on celebrating TEN - reaching double-digit age status is a big deal! I thought these mini Oreo birthday-style cakes would make a great festive treat for my son's birthday because he loves 1) chocolate cake, 2) Oreo cookies, and 3) sprinkles. So we started the birthday celebrations early and I made these last week to start the birthday "countdown". 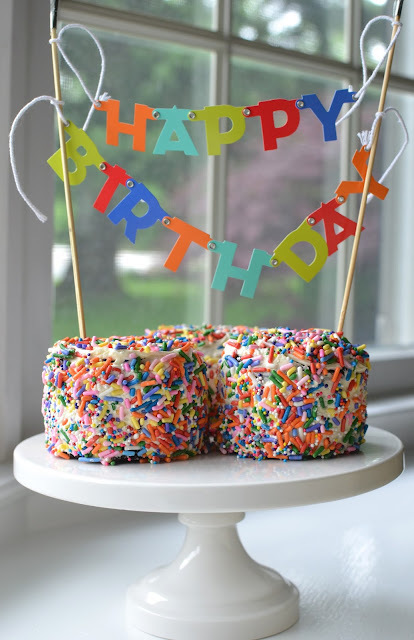 Normally, I'd make some kind of ice cream cake for my son's birthday but I went off-script this year with these little Oreo-sprinkle-chocolate cakes because, quite frankly, my son opted for a Carvel ice cream cake for his birthday party. I take no offense because how can I possibly compare anything I make with the ubiquitous Carvel ice cream cake (which I love as much as anyone else)? 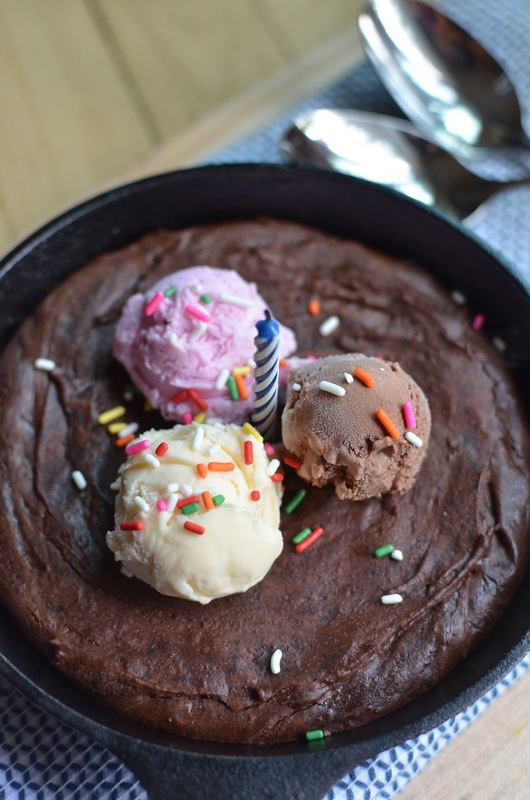 Moreover, I'm planning to surprise him with a small custom-flavor ice cream cake from a local ice cream parlor that he likes so I think we have the ice cream factor well-represented already. 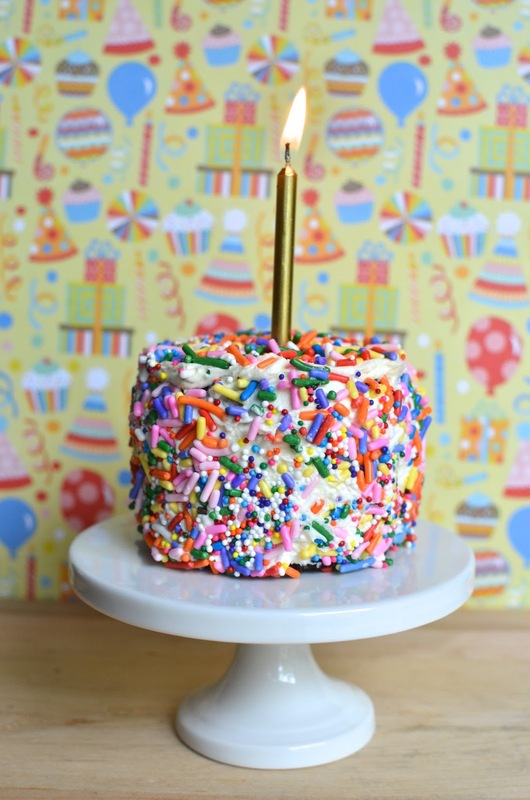 I think these sprinkles-laden chocolate cakes scream "happy birthday", don't you? Beneath the sprinkles and vanilla buttercream lies a very moist chocolate cake with an Oreo cookie imbedded right at the bottom! You want to hear something funny though? Children, and the things they say, are always a good source of comic relief and my son can be pretty frank with his opinions. While he was enjoying his cake and we were sitting down talking about it, I asked him about the Oreo cookie at the bottom. He very honestly told me, as he gave a little shrug, that the Oreo at the bottom tasted...well, kind of stale! It just cracked me up because he's just telling it like it is (we believe in honesty in this house). Truth be told, the Oreo cookie stays intact and still rather crunchy for the most part, with a little softness on top where it touches the cake. It's still good, and it's still fun, but that's how it is. These festive little cakes definitely brought some smiles onto the June birthday boy's face, and that makes me very happy. 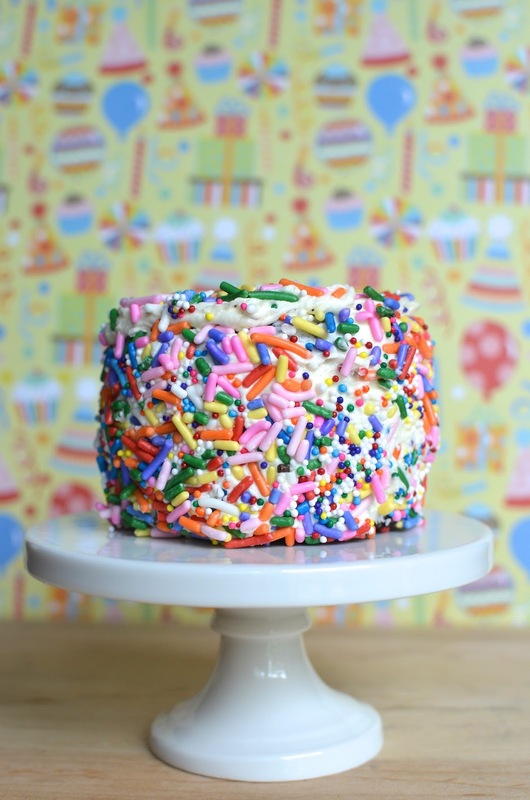 I think he particularly liked the sprinkles - though I have to say that these little cakes involve a lot of sprinkles. I actually turned a couple of these cakes into cookies and cream cakes (photo near the end of the post) and those went down quite well also. 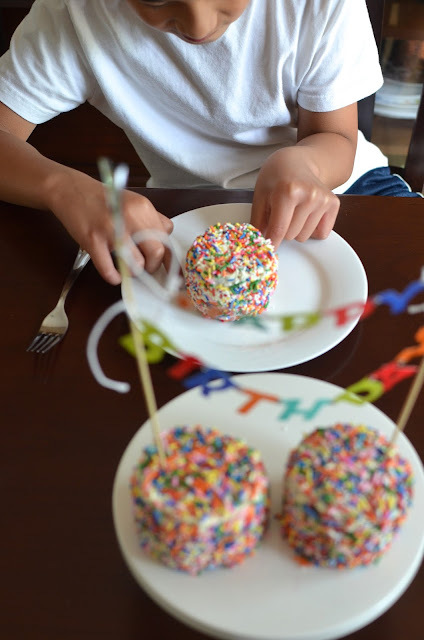 The June birthday boy is picking up stray sprinkles to eat before digging in. The fresh strawberries are so good, they quickly vanish as I simply eat them. As much inspiration as I've encountered, despite all the beautiful berry-filled desserts I've admired, I can't seem to muster the motivation to make a fruit tart or even whip up a cake with them. 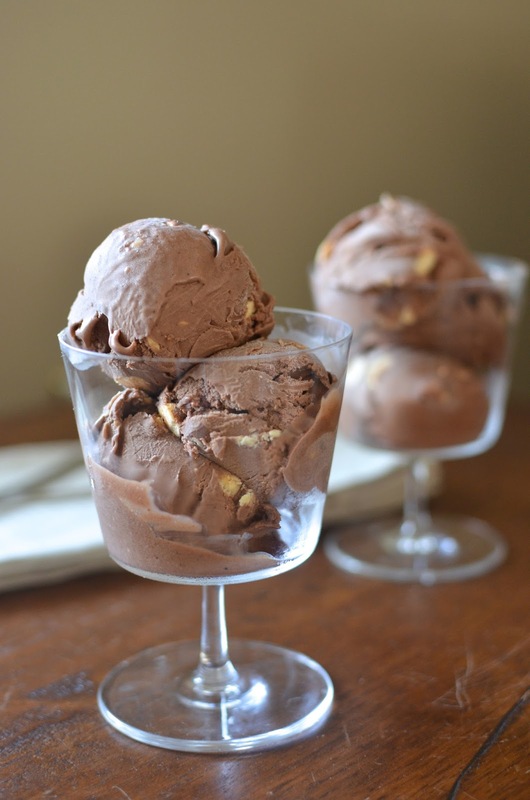 I'm just gorging on them straight-up while my husband likes a little chocolate or Nutella with it. I could only manage to assemble this simple strawberry dessert, and all it takes is assembly. 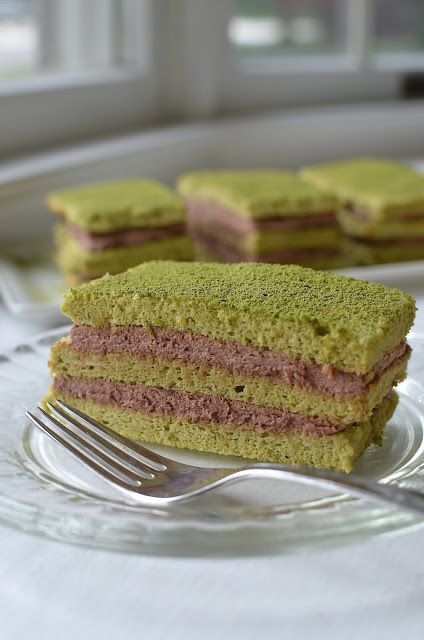 It's a loose interpretation of a mille-feuille or Napoleon dessert. I adapted the "recipe" from Gavottes, the original maker of crispy crepe dentelle - amazing wafer cookies that I simply love to eat as is or break up to mimic feuilletine in chocolate crunch bars. Very sadly, my local World Market stores seem to have stopped carrying Gavottes biscuits so I settled for similar ones available at Whole Foods. They are good but if you can get the Gavottes brand of crepe wafers, I highly recommend it because they are even better. The last time I made mille-feuille or Napoleon was back in May 2011 when I followed a somewhat more traditional route using puff pastry to form the crispy layers. This easy dessert takes that similar idea but instead of puff pastry, the crispy, buttery crepe wafers act as the flaky layers. 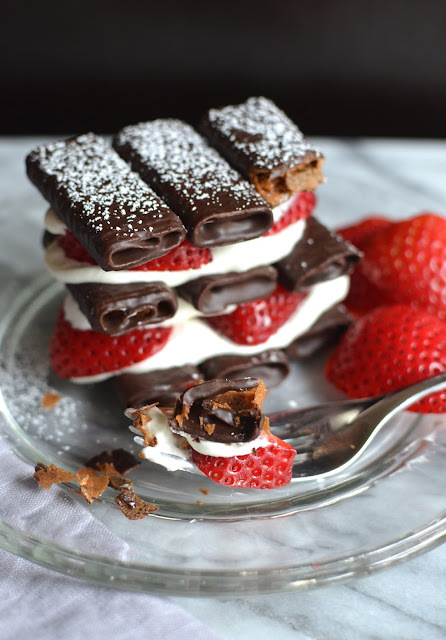 To make it, simply lay down a few of these wafers (I used ones coated in dark chocolate but you can find plain or ones coated in milk chocolate), top with some lightly sweetened fresh whipped cream, strawberries, and repeat. It takes very little time to put together. I'll be honest with you; this is a messy thing to eat! Your best bet is to take a fork/spoon and whack it to break the wafers down. It's going to disintegrate and look a mess on your plate but just scoop it up and you're rewarded with mouthfuls of strawberries and cream together with crispy caramelized shards of wafers coated with chocolate. For the most part, I'm going to continue just snacking on these seasonal fresh strawberries while they're available but it was fun to do a little something different with my hoard! Summer is "unofficially" here and we've been firing up the grill and enjoying the outdoor space (after a very thorough cleaning by my other half). The thing I love about grilling is working together with my husband. I get to be the sous-chef; I usually do the prepping and he takes care of everything else. One thing I've learned is to keep things simple in order to encourage more spontaneous cookouts. We usually grill plenty of vegetables to toss with greens and then pick a meat to go alongside. As you can imagine, we often grill chicken. I've learned that just a simple rub with curry powder or a marinade in teriyaki sauce makes for some quick and tasty grilled chicken. 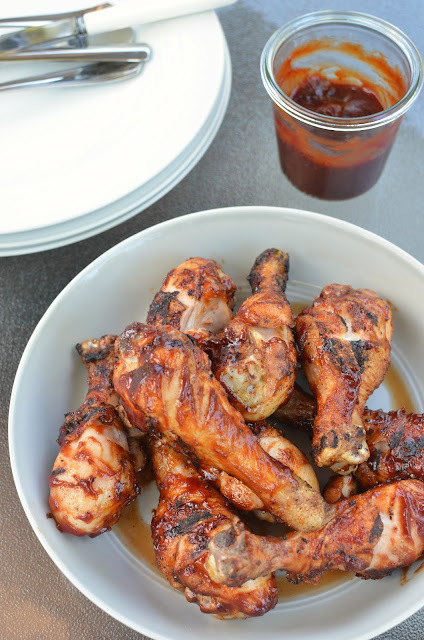 Recently, we've been cooking up some barbecue chicken, which is where this simple, basic pantry barbecue sauce enters the story. Do you make your own barbecue sauce? I haven't until now. Since I don't use it very often, I was satisfied with an Archer Farms barbecue sauce I'd been buying from Target. Problem came when this particular sauce was discontinued. I had no idea what to get and one day, about 6 months ago, I took a random stab and bought a similar-looking barbecue sauce for a slow-cooker pulled pork recipe I was making for the first time. The pulled pork turned out great but the barbecue sauce nearly ruined it because it was so spicy! I admit the word "cayenne" might have been mentioned on the bottle but, silly me, I didn't expect store-bought bbq sauce to actually be spicy! I had to douse the thing with extra brown sugar and honey and mix it with other things to tame it. Luckily, I managed and the pulled pork was saved but I learned that I'd better look into a good barbecue sauce alternative. So I was watching one of Rachael Ray's shows a while back and found her talking about her basic base barbecue sauce and ways to enhance it from there. It was just what I needed so I saved the recipe to give it a try. I went with the simple pantry route - making this barbecue sauce with: organic ketchup, dark brown sugar, maple syrup, cider vinegar, Worchestershire sauce, ground pepper, garlic, and opting for a familiar smokiness, a little smoked paprika. The end result is a simple, good, barbecue sauce that's just a bit sweet, a bit tart, and a bit smoky. Nothing earth-shattering but a very "clean" barbecue sauce where you can taste all the flavors going on. 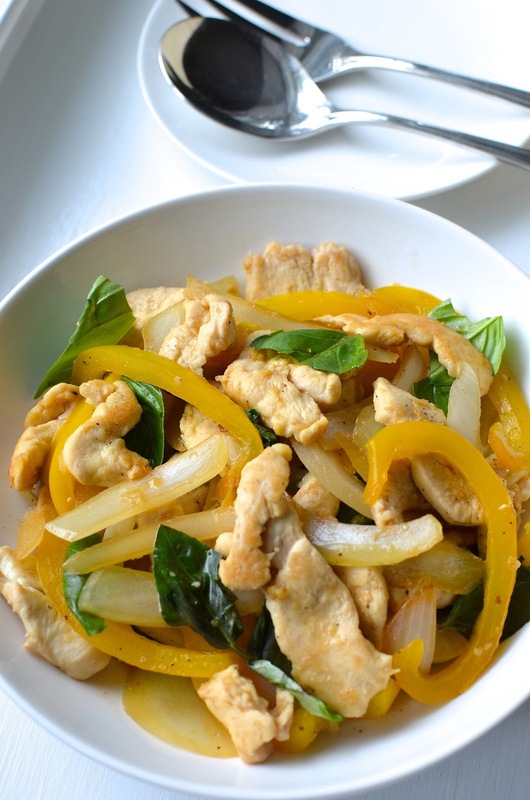 It's a great base to build from if you're more adventurous and looking for more complex flavors. You can strike up the spice factor with cayenne or chili powder or make Rachael's bourbon version starting with this base and adding dijon mustard, orange juice, and bourbon. For now, I'm content to stick with this simple pantry barbecue sauce this summer.